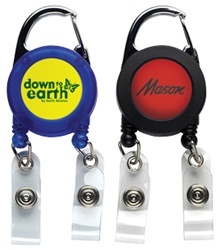 Custom Logo Dual Carabiner Badge Reel comes with sonic welded durable plastic body. Customizable Badge Reel features stainless-steel polished internal springs. Custom Logo Dual Carabiner Badge Reel is available in 2 colors: Opaque Black and Translucent Blue.